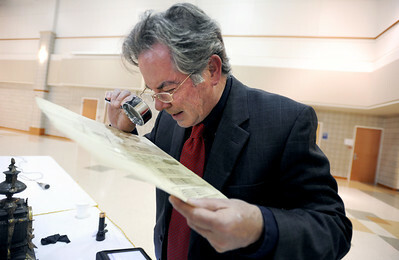 Sarah Nader - snader@shawmedia.com Guest antique expert and appraiser Mark Moran examines a portfolio of drawings from the early=min 19th century during a special antique appraisal event at the Home and Garden Expo at Hampshire High School on Sunday, March 18, 2012. Moran estimated that if the portfolio was slit apart it would be worth around $10,000. 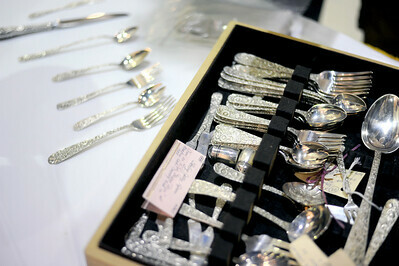 Sarah Nader - snader@shawmedia.com A set of Kirk $ Son sterling silver flatware set waits to be appraised by guest antique expert and appraiser Mark Moran during a special antique appraisal event at the Home and Garden Expo at Hampshire High School on Sunday, March 18, 2012. Sarah Nader - snader@shawmedia.com Roy Sucholeiki (left) of Elmhurst and his wife, Sharfi, and their son, Sammy, 8, listen as guest antique expert and appraiser Mark Moran appraises their French bronze clock during a special antique appraisal event at the Home and Garden Expo at Hampshire High School on Sunday, March 18, 2012. Moran estimated that the clock was worth $400-500. 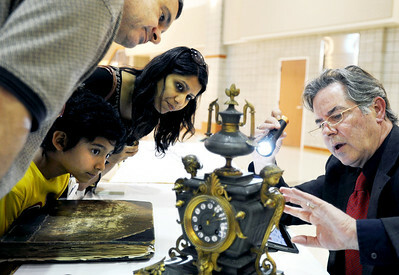 Roy Sucholeiki (left) of Elmhurst and his wife, Sharfi, and their son, Sammy, 8, listen as guest antique expert and appraiser Mark Moran appraises their French bronze clock during a special antique appraisal event at the Home and Garden Expo at Hampshire High School on Sunday, March 18, 2012. Moran estimated that the clock was worth $400-500.